We're happy to help refresh your roof signage! 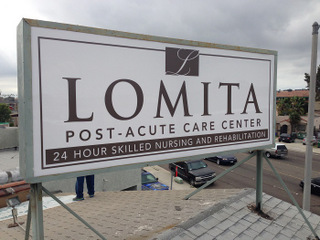 Located at 1955 West Lomita Boulevard, the Lomita Post-Acute Care Center is a skilled nursing facility that helps patents recover from injuries, surgeries and serious illnesses. The facility features beautiful landscaping, which sometimes makes it difficult to associate it with a care facility versus a residential condo community. The signage that the center already had was insufficient. To assist with branding, marketing and wayfinding, the facility’s management team contacted Superior Signs and Graphics to help with its exterior building sign refurbishing in Orange County, CA. We did a successful roof sign update. Now the center has a new translucent panel marker on an existing roof sign cabinet. We also added a new design. 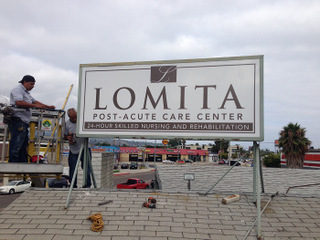 It is now easy for motorists and pedestrians to pinpoint the location of the Lomita Post-Acute Care Center. At the same time, this signage does not destroy the beautiful look of the landscaping and the careful cultivation of an almost residential setting around the facility. A look at the refurbished sign! Nursing home exterior building signs for Orange County area venues have to succeed at helping current and future clients – and their families – to find the facilities. Since the trend is now to skillfully integrate these facilities into areas that are also zoned for residential living, large signage and obvious building markers are considered out of place. This is where roof signs can frequently make a huge difference. Even thought the facade is kept in harmony with the neighborhood, the roof assists first-time visitors with locating the homes. 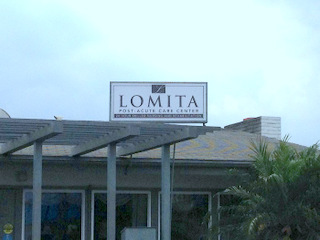 In some cases, acute care center exterior building signs in Orange County also take the pedestrian or motorist to medical park locations. Frequently, marker options here rely on a combination of technologies to make the venue easier to find. Examples abound. Ask us about giving your exterior signs an update! Monument sign and channel letter marker. The monument marker identifies the entrance of the medical office park and its associated parking structure or lot. The channel letter sign helps visitors to pinpoint the correct building, which is particularly important when there are multiple structures on the campus. Parking lot sign as well as a post and panel marker. For multiple buildings, let the parking lot marker help drivers find the entrance to the lot. To then make it to the right building, the post and panel sign – complete with arrows – helps with narrowing down the location choice. Lightbox cabinet and channel letters. The cabinet is frequently set up in a manner that is reminiscent of a monument sign. The channel letters go up onto the façade, where they identify the building. This is particularly useful for larger buildings, main structures or buildings that have their own names. When you call our experienced care center signage experts, we will begin with a site evaluation. Since the comfort of your patients and the aesthetics of your setting are major considerations, it only makes sense that we get a good understanding of mounting locales and size restrictions that we have to work with. Next, we will see if there is already a sign set up. In some cases, sign refurbishing is really all that is needed to draw attention to the venue. In other cases, a more modern marker can make a huge difference in the way that your locale is perceived.